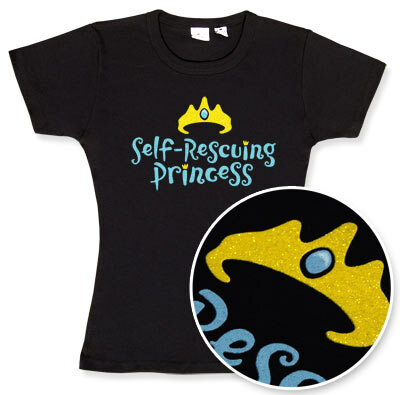 "Self-Rescuing Princess" is printed in turquoise blue beneath a glittery crown / tiara on this black, 100% cotton ladies' shirt. Looser cut than he babydoll tee, this is considered a "classic cut". It's styled for women, but is not tight or fitted. But you can buy it at ThinkGeek.com, this is where we took description from.